All perfect ingredients for a spy series. 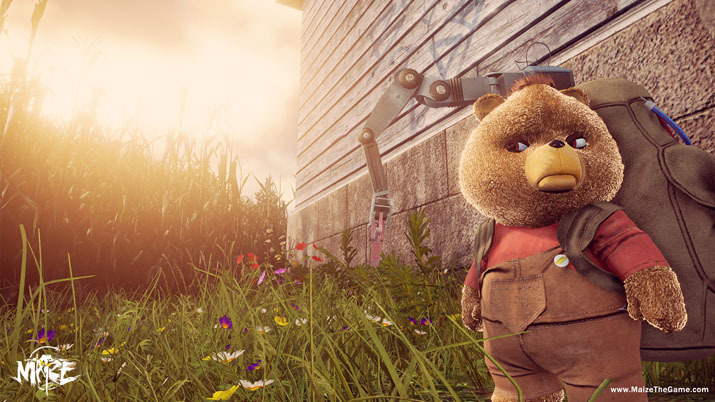 But what if the secret government program was involved in making sentient corn, the Russian ally was a teddy bear, and the secret weapons were stalks of corn? Well, those are the random, weird, and hilarious ingredients that blend to create Maize. 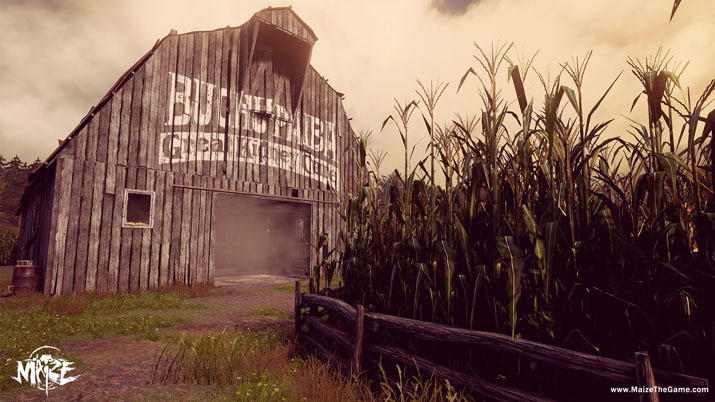 Maize, a first person adventure, treats you like an idiot and works very hard to make you feel like one too. While it is an adventure game, you do not have to use your brain at all to complete the adventure. When you need to collect an item, the item lights up and becomes highlighted in yellow. When you need to put an item down or use it, there is a very clear outline of what item you need and where exactly you need to place it. If you’re stuck with a task, (which is highly unlikely) you can examine objects, and some of the descriptions for the items tell you exactly what to do with it. There are useable items and then 75 collectible items that tell you more about the characters and the story. However, you can easily collect 90% of the collectible items without even paying attention. The only way Maize could have been any easier is if the characters told you to “Pick up rock. Put rock down”. Not only are the tasks designed to treat you like an idiot, but also your loyal yet cruel, Russian teddy bear sidekick, Vladdy (typical Russian) never misses an opportunity to insult you and straight-up call you an idiot. When he joins your side, be ready to be insulted in a Russian accent for the remainder of your adventure. He doesn’t believe in you, thinks you’re an idiot, and when you ask him to do things, he complains. However, personality traits and characters like Vladdy are truly what make Maize enjoyable. Each character has its own personality, most of which are either insanely idiotic or extremely mean and degrading. Bob and Ted, (kind of like Bill and Ted’s Excellent Adventure) are the government scientists who act just like Pinky and the Brain. Ted is the brains of the operation and loves the research he does. He constantly has to take care of Bob and deal with the crazy things he does. Bob is the idiot that never should have been hired as a scientist and has no idea what “Top Secret” means. He is a slob, leaving food wherever he goes, and for some odd reason built hundreds of statues of himself. While you never actually meet Bob or Ted, you find sticky notes they left for each other throughout the lab. Most of the time you can tell which is Ted because of the capital letters and constant use of the word “idiot,” which is clearly a theme in this story. The sticky notes are another story within the main story that is used to learn more about the two characters and their government research, which I think is an interesting and unique portrayal. Although extremely random and strange, Finish Line Games created a storyline that is funny and plainly put, really enjoyable. Maize was clearly not meant to be serious, yet its lighthearted nature makes it fun and entertaining. The dialogue and the interaction between the characters are the true gems . This running dialogue throughout the adventure is hilarious, and even the hints given to you make you chuckle. For example, there’s a running joke in Maize that “pressing Q will not do anything.” It is completely random and had nothing to do with anything, yet I laughed every time it popped up. And just like that, Maize will make you smile and laugh, but it is not for the truly serious adventure gamers. It is more like an interactive movie than a game. While the graphics are just average, the mood created by the environment and scenery makes your exploration in the cornfields and “secret” research facility enjoyable. Finish Line Games developed just enough scenery and areas to play out the story. The sounds are also excellent and give you an ominous feeling when you’re exploring alone and hear a rustling of the leaves, which makes you feel like you’ve entered the story right in the beginning. Also just like a theatrical movie, there is a completely random and hilarious twist at the end. Throughout the adventure, there are little clues that lead to this ending, but you don’t realize until you finish the game and get that “ah-ha!” moment, just like any great movie. Maize takes about five hours to complete and for the same price as a movie may just be worth it. However, like some movies, Maize has no replay value, as the main selling point of the game is the story. Once you play out the story and learn about the characters, there is no real reason to play it again. The theme of Maize is clearly about being idiotic. The game treats you like an idiot by the way it presents such easy tasks, and the characters make you feel like an idiot by constantly calling you one. This is definitely not a good choice for the serious adventure seekers out there or those that can’t take a joke. There is no real challenge, the antagonist is an idiot, and you can’t even really die. The goal of Maize is simply to make you laugh. It is refreshingly hilarious and provides a randomly unique movie-quality storyline that you can’t get anywhere else. If you need a break from life, or from other serious games, this is just the laugh that you need. You will enter a world of idiots, where you reign supreme.